Your favourite uncle just sent over the brand new iPhone 4S, and you can't wait to install all the cool apps your friends have been talking about. 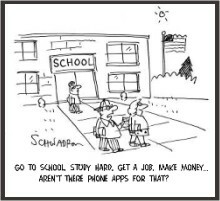 Or you finally saved up enough from the meager wage you get for teaching your dumb student, and got yourself a Samsung Galaxy. Whatever may be the case, RS is here to get your smart-phone to do justice to its name. Before you start downloading anything off the net, make sure to get yourself an anti-virus, unless you're the proud (and probably snobby) owner of a non-jailbroken iPhone. For those who don't know, jailbroken iPhones can download any app, even those that the app store thinks might be bad for your phone. And some of them are really bad, trust us. Threat of hacking and malware is pretty rampant in the dark regions of the app-world if you're an Android user, and we recommend AVG Mobilation Antivirus. Once you've covered the basic social apps such as Facebook, Twitter and Skype, add Whatsapp, an app which allows you to text and share with your contacts for free with minimum internet connection for one trial year. Then there's a world of games to conquer. Although there's everything from Sudoku to Zombie Attack, there are a few apps everyone should try out. That includes Fruit Ninja, for all those aimless hours in traffic when slicing up bananas and avoiding bombs is all you can do to stay sane. Doodlejump is another such time-passing game quoted by His Genius Sheldon Cooper himself. It's basically a doodle which jumps to higher levels for scores. To leave out Angry Birds would be sin, or so it would seem. Yours truly doesn't get the big deal about pelting flightless birds at a bunch of pigs, but eh, each to his own. If you're looking for something a bit more challenging, Drag Racing is one game sure to keep you more than occupied. You can earn game bucks by racing and buy yourself cool racing cars to go with the fad. People who like racing games in general should also try out Lane Splitter, where you split lanes (like duh) to avoid crashing into traffic at insane speeds. In real life however, we don't really get to split as many lanes and end up listening to the radio quite a lot, during which we stumble upon rare bits of beautiful music, which we eventually lose. Fear not, for Shazam is here - an app which can listen to any recorded music to extract tags so that you can run it down later. However, the music needs to hit international market for the app to recognise it. That rules out most Bengali and Hindi songs. If you're studying in university, and running down all kinds of things, a scanner on the go would be well-appreciated. Camscan is an app which uses your camera to make pdf versions of whatever is in front of you. It's as simple as taking a picture. Speaking of pictures, what would a smart-phone be without a photo-editor? Adobe Photoshop can help with your basic editing, but we recommend a combination of Colour Effects and Photowonder to get your edit-tools just right. From beauty tips to free guitar lessons, app-stores have it all. This is anything but a complete a list, but all these apps are worth a try. One of the greatest mysteries surrounding Bangladesh, and the world, are missing socks. People lose their socks. This happens every few weeks. Socks tend to vanish into thin air and nobody knows how. This wouldn't be quite as annoying if people had a lot of socks, but who bothers to go sock shopping? Another annoying thing is how only one sock goes missing at a time, so one day we wake up and realise we'll have to wear different socks on each foot. That's quite the fashion faux-pas and can be pretty embarrassing. Another recent, yet widely ignored mystery is the appearance of giant fish in the rivers of Bangladesh. My friend recently came upon a fish the size of a CNG. Apparently her uncle captured it on his ship and was so impressed; he had it sent to his house, where it was displayed for the locals. My argument that this fish was indeed a whale was quickly proven wrong and for now it is assumed to be a giant 'Koi Maach'. That is but one example of many. Giant fish have been popping up all over Bangladesh and people couldn't be happier. On the face of it, these seem to be completely unrelated puzzles, but delve deeper and a pattern pops up. The missing socks don't just disappear. While being washed by our maids with Gopi Bahu on their minds, they go down the drain. They then traverse the sewage system and eventually end up in the rivers of Bangladesh. The inhabitants of these rivers are none other than fish. Fish obviously love the smell of dirty socks. This is because fish stink and so the socks are something they can relate to. Out of curiosity, the fish eat these socks and the effect of whatever strange chemicals the Bangladeshi garments use cause the fish to mutate. This mutation leads to the fish growing exponentially in size. Hence we are left with giant fish. Giant, delicious fish that could solve our hunger problems. Eating these fish does not seem to have any ill effects, till now (the sudden appearance of my sixth finger, I assure you, is purely coincidental). This is not just mere speculation either. It makes perfect sense if you think about it. If I were the president I'd make a giant fish tank and fill it with small fish. Then I would engage them in a strict diet of weeks old, Bangladeshi worn socks. Giant 'Rui' and 'Eelish' Fish would go over very well with the masses of our country and maybe we could breed some super piranhas for war purposes? This way I would solve the hunger crisis in our country and since everyone likes fish, it's a win-win situation. Moral of the story? Samama Rahman for president. There are a lot of books which promise to change the way you live after reading them. Few stand up to their promise. Then there are those small number of books which don't promise anything at all but end up altering your life anyway. And this week, we have one of those kinds. 'The perks of being a wallflower' is a novel about fifteen year old Charlie (a pseudonym) and his life. It's written in the form of letters addressed to 'you' (the reader). Charlie just wants to be friends and talk to someone and comes across as a scrawny teenager with everyday problems. He's the quiet kid in the corner of the class; the one who never speaks much but says a lot in his head. The story starts off with Charlie telling us about the suicide of his best friend, Michael. It picks up and drops pace alternately from then on, varying in rhythm but surprisingly keeping hold on the same tone through and through. It's written from the perspective of a fifteen year old and it shows; yet you can't help but relate to the story. The novel touches on many aspects of teenage life and most of it centres around family problems and abuse in everyday life. It advertises the concerns regarding peer pressure, relationships and the supposed perks of youth. Perhaps this familiarity is why the book seems very friendly and Charlie starts to grow on the reader continuously as the book progresses. The book does talk a lot about drugs, girl problems, childhood abuse, but what makes the book and its characters seem so real is the fact that the novel does not dwell on any of these topics for long. Nothing seems exaggerated or fictional. The story has a solid ending which keeps the reader yearning for a few more pages. The bad part is that it is difficult to find drawbacks of the book. It's what makes this writer hate the book a little. Its perfect narration and, of course, Charlie's sensitive character makes the reader wish for a negative side; for the sake of propriety. On a slightly different note, the movie is coming out on Semptember 21st of this year and will star Logan Lerman (Percy Jackson and The Olympians) and Emma Watson (No need to introduce her, right?). Either way, this book is definitely worth a read.